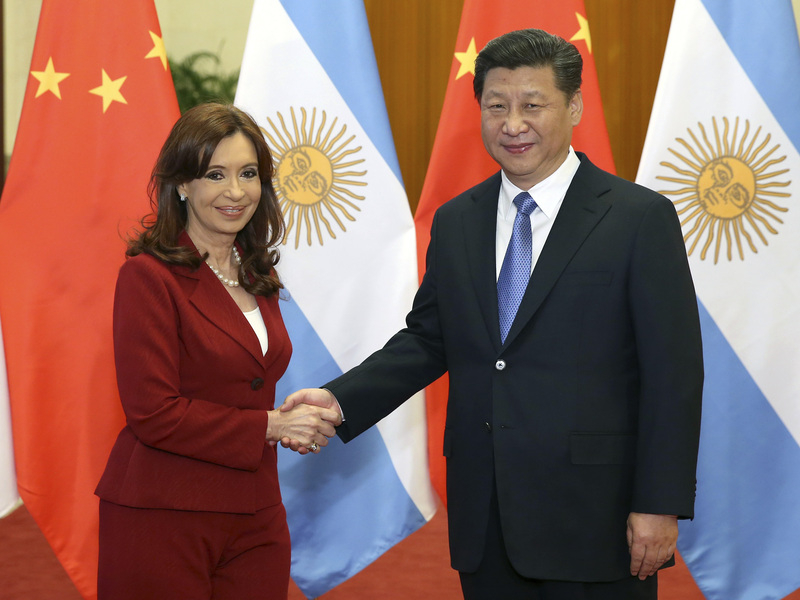 An agreement by Argentine President Cristina Kirchner with Chinese president Xi Jinping to build a new Hualong One reactor in Argentina represents the first export agreement for the ACP1000. It is is a joint effort of CNNC and CGN. It will be tagged as Atucha 4. China and Argentina also ratified an agreement developed in 2014 to build a second reactor in Argentina (Atucha 3) based on Candu PWHR technology. The accord was signed a high level Argentine minister Julio De Vido and the vice president of CNNC Nur Bekri. The deal for the Hualong One include transfer of technologies from China to Argentina’s Nucleoelectrica Argentina SA, local manufacturing of components including nuclear fuel fabrication. China will supply the enriched uranium for the plant for its entire life cycle. No time frame for start of construction was provided, but a financing agreement is expected to be completed in 2016. Argentina’s finances, never the best even in good times, means the money for the deal will come from China for financing construction and possibly an equity position in the plant. According to the World Nuclear Association, Nucleoelectrica Argentina SA already has intellectual property rights to build a Candu type reactor. There are two in service in the country. Nucleoelectrica will be the designer, engineering lead, builder, and operator of the new 800 MW power station. CNNC will provide equipment and services and components for Argentine firm to manufacture systems to be used in the reactor. Financial terms for the deal are likely to involve a substantial position for Chinese firms both in terms of covering construction costs and having an equity position. This is the second Candu export deal for China having inked an agreement for two of them in Romania at its Cernavoda site. Argentina’s finances have been troubled for years, and in August 2014 the country was forced into default as a result of a complicated series of court suits by the country’s bond holders in the U.S. The country’s troubled financial history will weigh in the balance for the new reactor deals. Whether China is willing to carry all the weight in return for a market opening for its nuclear exports remains to be seen. Depending on who’s talking, South Africa either has a $50 billion deal with Rosatom to build 9.6 GWe of nuclear energy powered electricity generation or there is an open procurement for the world’s reactor vendors. Either way, South Africa still has to find a way to pay for it. In the latest act in a continuing media circus, and political sideshow, the National Treasury in South Africa said Feb 1 that it has no idea where the money will come from. Further, in a three year look ahead, the agency says conditions are not likely to improve. That didn’t sit well with South African President Jacob Zuma, who is a proponent of the Rosatom deal. While hanging out among the global elite at Davos in Switzerland, Zuma said details on how financing would be achieved would be forthcoming in March as part of the release of the government’s budget. Meanwhile, good government groups, including a coalition of church and green organizations, demanded to see documents about the proposed nuclear program and how the government plans to pay for it. The Treasury Dept. refused the request saying that since there are no funds available, there are no documents to provide to the public. The Energy didn’t bother with a bureaucratic excuse. It just said no. In point of fact, the Energy Dept. is worried about the numbers associated with the Russian deal. A build of eight 1200 MW VVERs for $50 billion comes out to about $5,200/Kw. However, in a pricing analysis released last Fall, the agency said global prices for this kind of power are running closer to $6,500/Kw. The threat of massive cost overruns has a lot of people spooked. While some cost savings could be achieved once the first two or three units are completed, they may not be enough to offset the true cost of the plan. The federal government’s budget request for fiscal year 2016, which begins next October, includes $908 million for nuclear energy programs, with a 15% increase included in that number for licensing and technical support for small modular reactors (SMRs). The actual figure is reported to be $63 million an $8 million increase over funding available in FY2015. However, DOE has reduced its request for funding advanced reactor concepts by $25 million from $133 million in FY2015 to $108 million in FY2016. On the other hand, it increased its request for fuel cycle R&D by $21 million to $218 million in Fy 2016. Separately, the U.S. Nuclear Regulatory Commission submitted a downsized budget with a significant reduction in the number of positions for the new reactor division. Layoffs could be possible in FY 2016 from an agency which was twice listed as one of the best placed to work in the federal government. The U.S. Nuclear Regulatory Commission has rejected a petition by the anti-nuclear group Beyond Nuclear that call for the agency to order the shut down of 22 boiling water type reactors in the U.S. The group claims that the BWR type design, similar to the units damaged by an earthquake and tsunami in Fukushima, Japan, in 2011, are unsafe. The NRC responded, via a Federal Register Notice on January 23, 2015, that it was implementing “lessons learned” from the events at Fukushima. It said new rules by the NRC will require that certain safety systems be able to operate even if there is no external power at the reactor site. Backup diesel generators are being installed at 70 sites by US nuclear utilities to comply with the new rules. Other parts of the rules address venting of hydrogen during an emergency. Had the anti-nuclear group prevailed, one of the largest BWR sites in the country, TVA’s Brown’s Ferry, which has three reactors, would have gone offline with a massive shift to coal and natural gas plants to keep the lights on. In the end, the NRC said no to Beyond Nuclear because it was already doing its job. Shutting down the reactors would not have served any useful purpose. More accurately, it could read “Additional backup diesel generators are being installed at 70 sites…” Each plant already has equipment in place to provide AC power in case of a loss of off-site power. After Fukushima Daiichi, more equipment, including portable diesel generators, portable pumps, and other equipment are being added. These additional measures are often referred to as the FLEX strategy.